A part of the medieval fortification around Brasov, the Black tower was built in the 14th century. The tower is actually beige in colour but it got its name after it was struck by lighting in 1559. The tower has a height of 11 meters and was last used during the 18th century plague epidemic that grappled the city. The unique thing about this tower is the glass roof that was added to the structure in 1995. The tower consist of 4 level, with opening on every side of the gallery for firing. 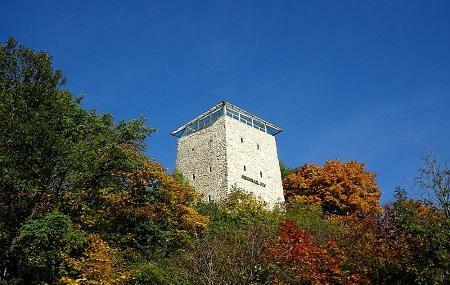 During the medieval times, the tower provided a vantage point over the Warthe Hill for defending the city. Throughout its existence, the tower has survived two fires caused by lightening and even today, its gorgeous stone construction stands beautifully against the surrounding landscape. The entrance to the tower is at a height of 2 meters and when its was in use, could only be accessed by a ladder. Today, you can find a rare exhibit here consisting of craft artefacts made by craftsmen guilds in medieval Brasov. Free: for persons with disabilities. Close to the city centre, worth paying a visit. It offers a nice panorama of the city and Tampa hill. I love to be here especially in winter nights. There is a very nice view of the town. Fortunately Brasov has many belview points situated in different areas of the city. It is recomended to see them all to take beautiful pictures.